To spend a day on the island of Korčula is to spend a day immersed in history, rich culture and sunlit sand and pebble beaches which are some of the most beautiful beaches in Croatia. How to get to Korčula? To get to Korčula, that is the ferry dock in Vela Luka, you need to take a ferry from Split: Split – Vela Luka – Ubli (Lastovo), or catamaran: Split – Hvar – Vela Luka - Ubli. After you get to Vela Luka, you might go straight to the historic town of Korčula, the biggest town on the island. You will also find a couple of interesting museums in town. The town museum of Korčula is located at the main square, St. Mark's Square. The museum's exhibits are connected with the long and exciting history of the island of Korčula ruled by the Venetians, French, English, Russians and Italians. There is one other museum on the St. Mark's Square – Opatska palača – with sacred art paintings. The central place on the square is taken by a renaissance cathedral of St. Marcus which was built between the 13th and 16th century. There is a house in the town, and it is the alleged birthplace of the world-famous explorer Marco Polo. Even though his origins from Korčula aren't scientifically corroborated, it doesn't diminish the pride the locals take in the idea of sharing their hometown with such a famous personality. His house is worth visiting for the vistas of the old town you can get there. In the Kaporova Street, near the baroque church of All Saints, you can find the Icon Gallery where there's an interesting collection of Byzantine icons. Besides the fact that you'll be charmed by the historic sights, Korčula will delight you with cafes and small shops in the old city center which sell jewlery and homemade souvenirs – ideal gifts for your friends and family. After taking a tour of the historic town of Korčula, take a detour into the nature's embrace and witness a natural phenomenon very unusual for an island. Only 3 km away from Korčula, not far away from Žrnovo, there is a protected reserve Kočje. Here you'll find a unique and magical combination of big dolomite rocks and lush flora. The whole reserve resembles a labyrinth with intertwined irregularly shaped rocks and evergreen oak trees, cave spaces and passages framed with trees. After finding your way through the labyrinths of Kočje, take a break on one of the many beaches of this island. 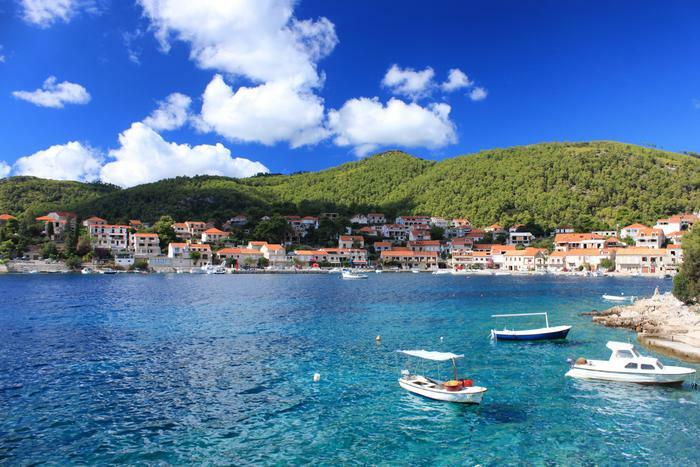 We recommend Lumbarda, a tourist village on the north-east part of Korčula which will delight you with its sandy beaches. Lumbarda is very popular not only because of its beaches but also because of the relatively peaceful surroundings which make it ideal for families with children. But even if you're without children, the sandy and pebbly beaches in Lumbarda, together with the crystal azure sea, will make sure you have an unforgettable experience. Where to stay on Korčula?